Camping Cala Ginepro, a campsite in Orosei facing out to sea with pitches and bungalows, offers large spaces that are ideal for groups and large families holidaying in Sardinia with their own large tent. In the shade of the lush pine forest, rich in Mediterranean essences and fragrances, you can choose large pitches for large tents, with dimensions above 20m². 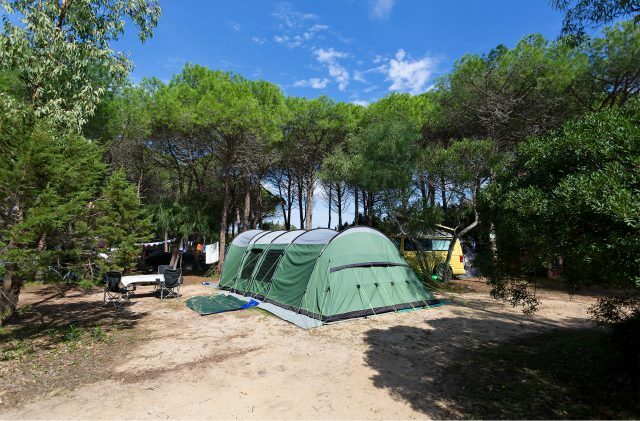 Camping in a tent in Camping Cala Ginepro allows you to immerse yourself in a unique experience with numerous facilities, enjoying a classic open-air holiday. The campsite pitches intended for tents offer electrical energy (max 5A) thanks to the free power points; in addition, hot showers and the entry of a car or motorbike are included in the cost. The reef and the wonderful fine, white sandy beaches of Cala Ginepro and Sa Mattanosa, which can be reached in no time, are perfect for total relaxation by the sea, and for swimming, snorkelling and diving. Thanks to the shallow, gently sloping seabed and the crystal-clear water, our campsite in Orosei offers the opportunity for unforgettable holidays for adults and children alike. Your holiday in Sardinia, your campsite in Orosei...Relaxation and fun await you at Camping Cala Ginepro! Discover all the services and facilities designed for you, your friends and family!